Create a fresh look in your home with a few easy changes. What is the best light to mimic natural (high density) sunlight? To achieve a light similar to the full spectrum of daylight, lighting professionals recommend a flourescent bulb with certain specifications: 32 watts, 4-foot length, 6000K color temperature and 80 color rendering or above. 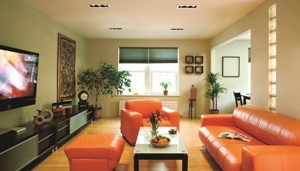 To get answers to all your home lighting questions, contact an Hortons Home Lighting showroom. Confused about which light bulb to use? To see the various kinds of light bulbs and where they work best, check out the Energy Star Choose a Light Bulb Guide. The guide also shows different color temperatures in which Energy Star bulbs are available. Contact an Hortons Home Lighting showroom for help with selecting the best light fixtures and bulbs for your home. It’s the beginning of a new season; it may be time to lighten the mood by modernizing your fixtures. Replace dark shades with lighter ones. A small change, such as changing a shade on a table lamp, sconce or a chandelier, can freshen up a space without costing a lot. It is particularly important to use light-colored shades if surrounding paint colors and accents are darker in tone. Change the trim around recessed cans. Newer, more popular minimalist styles and a range of finishes are now available, whereas standard white trims used to be the only option. If the longer, brighter days bring more natural light into your room, try adding low-voltage lights as accents and spotlights instead of relying on a main overhead light source. Repositionable fixtures offer flexibility and control in directing light individually toward chairs and artwork. Get rid of the brass. This finish on fixtures was popular 20 years ago. They are a sure signal that lighting is outdated. Add some pizzaz over a dining table by exchanging a chandelier for a few pendants with colorful or patterned shades. Visit your local Hortons Home Lighting showroom for expert tips on updating your home’s lighting.